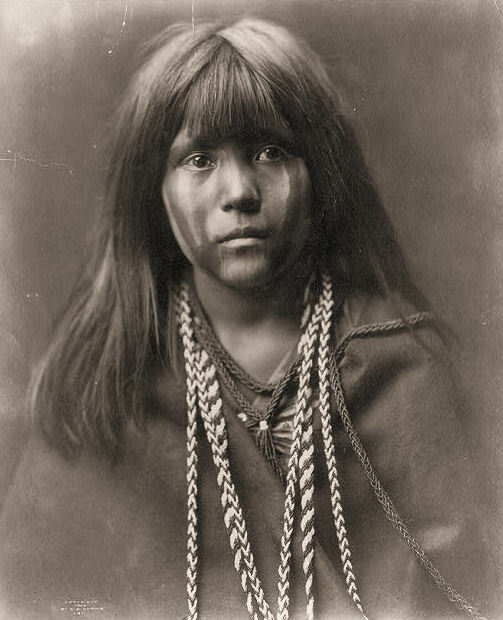 From 1899 to 1929, photographer Edward S. Curtis documented Native Americans living west of the Mississippi, visiting more than eighty tribes while seeking to photograph their original customs and traditions. Below is a select sampling of the thousands of photos he produced during his thirty-year career. 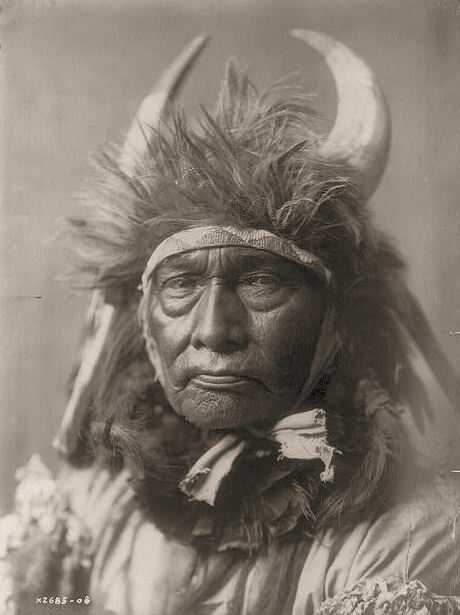 Left - 'Bull Chief' (Apsaroke Tribe) wearing a headdress with horns. 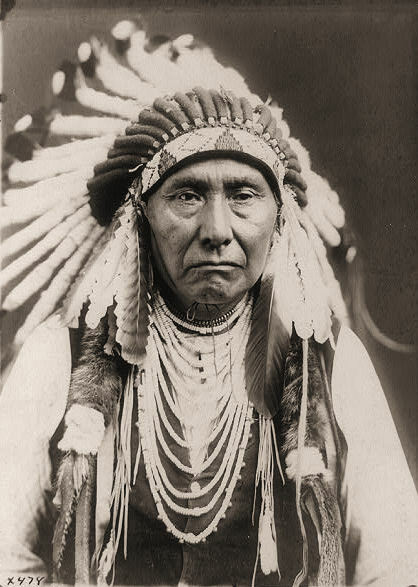 Mid - Chief Joseph (Nez Percé) wearing a war bonnet and several necklaces. 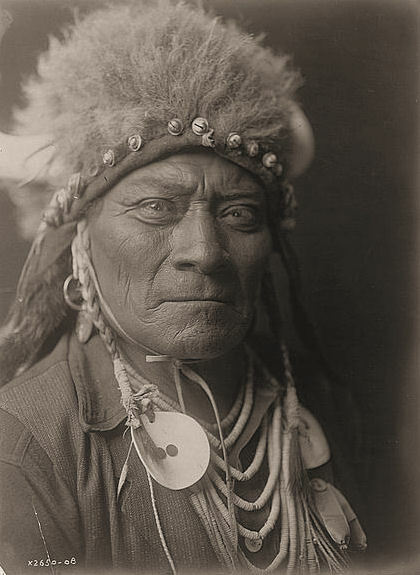 Right - 'One Blue Bead' (Crow) wearing a headdress and necklaces. 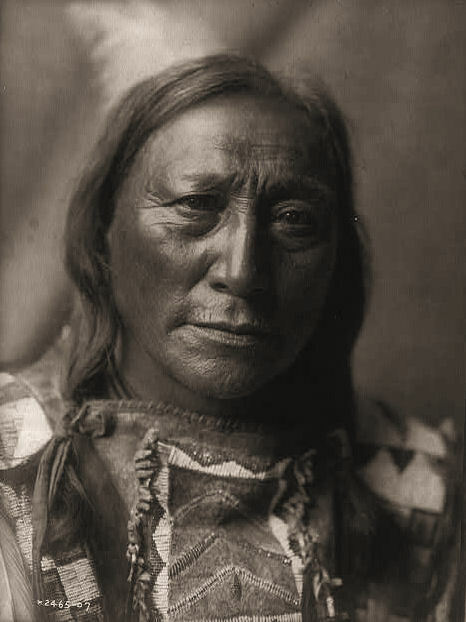 Left - 'Hollow Horn Bear' (Brulé). Mid - A Mohave boy. 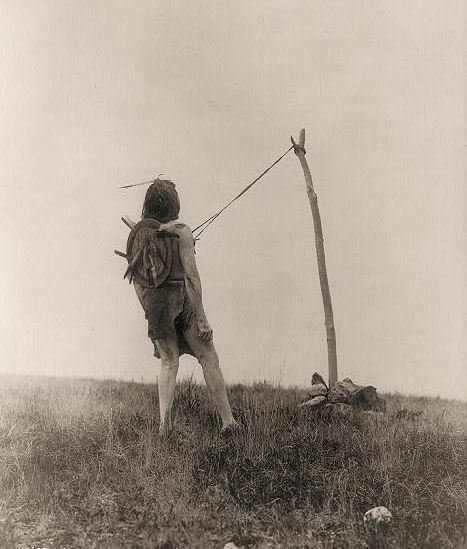 Right - 'Two Leggings' (Apsaroke) holding a bow and arrows. Left - A dance to restore an eclipsed moon. 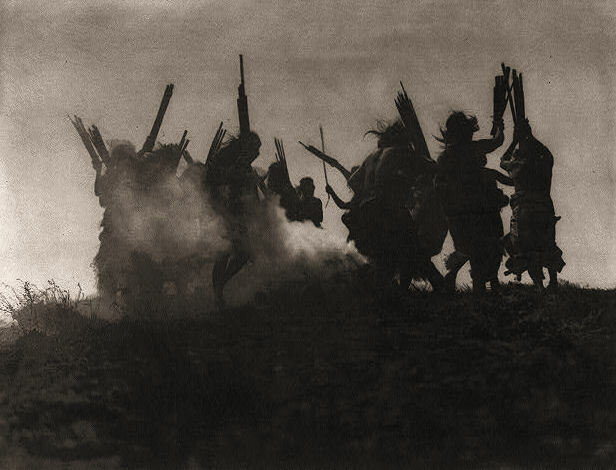 Several Kwakiutl people dance in a circle around a smoking fire, in an effort to cause a sky creature, which they believe swallowed the moon, to sneeze, thereby disgorging it. 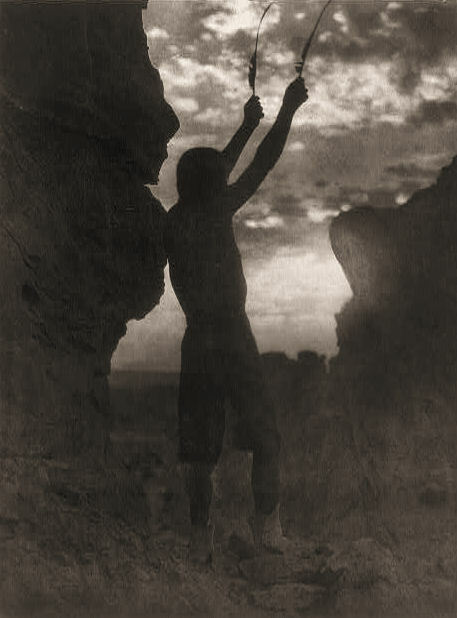 Mid - An offering to the sun by a Tewa man with hands raised skyward, each holding a feather. 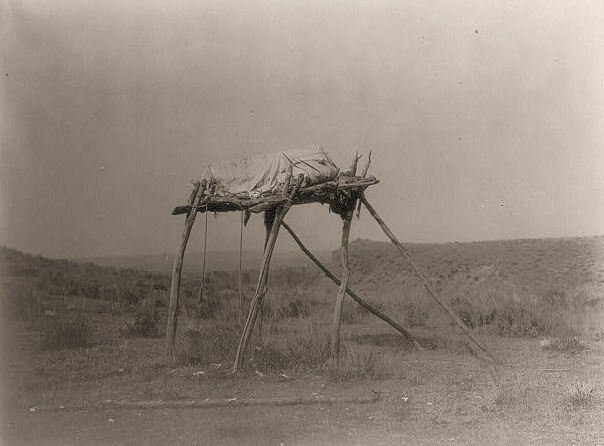 Right - A burial platform (Apsaroke). 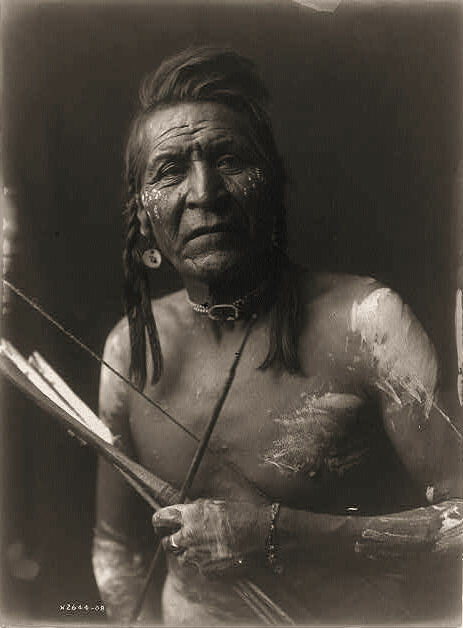 Left - An Apsaroke man, leaning back with strips of leather attached to his chest and tethered to a pole secured by rocks, all part of the piercing ritual of the Sun Dance. 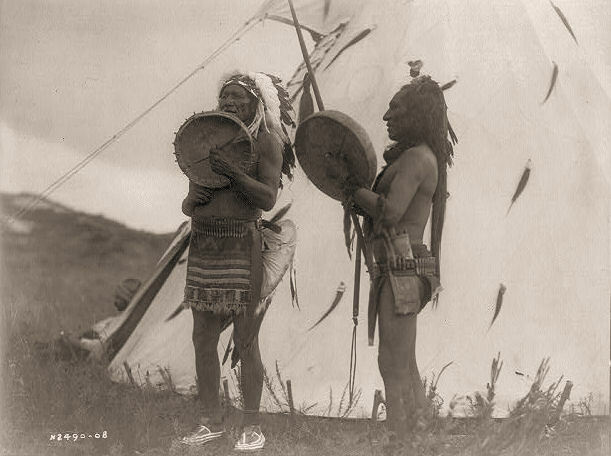 Mid - Two Dakota men singing deeds of valor while playing hand drums. 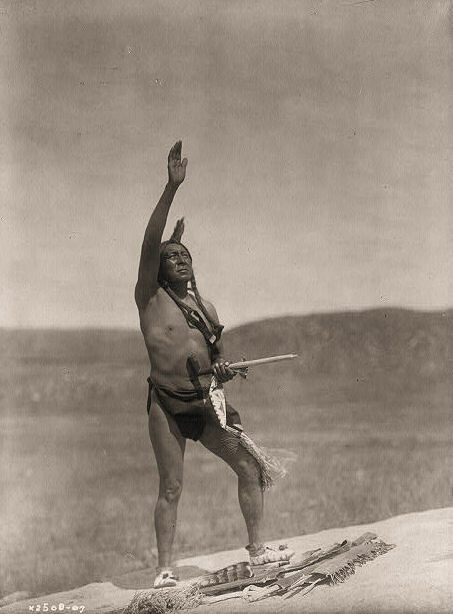 Right - Invocation by a Sioux man, wearing a breechcloth, holding a pipe, with his right hand raised skyward. 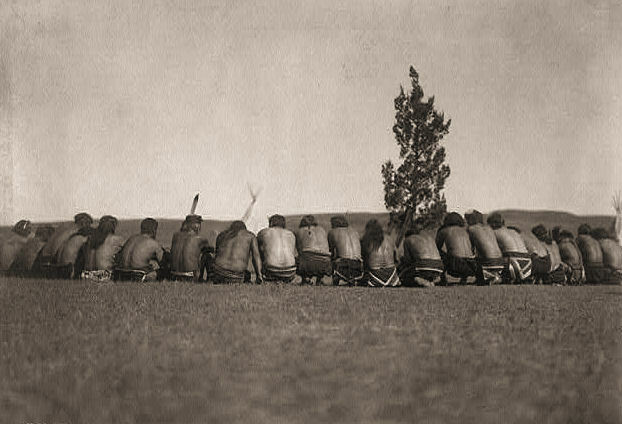 Left - Arikara shamans, seated in a semi-circle around a sacred cedar tree. 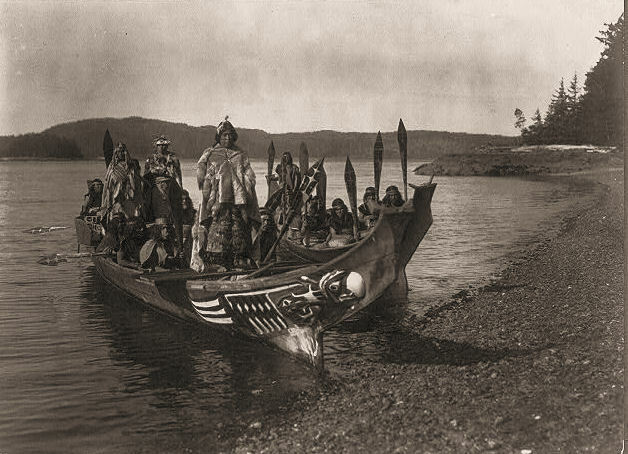 Mid - Two Qagyuhl canoes pulled ashore containing a wedding party, with bride and groom standing on the "bride's seat" in the stern, while a relative of the bride dances on a platform in the bow. 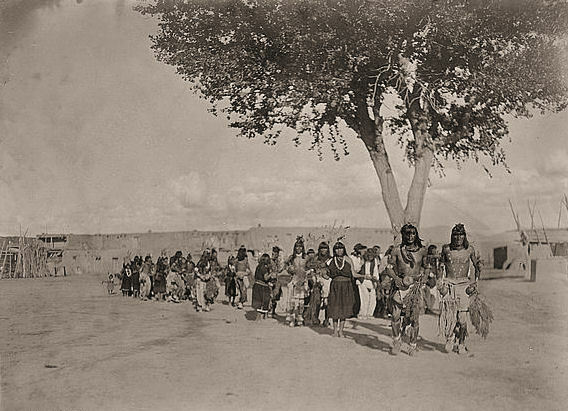 Right - Tewa people, dancing in line formation, performing a Tablita (corn) Dance. 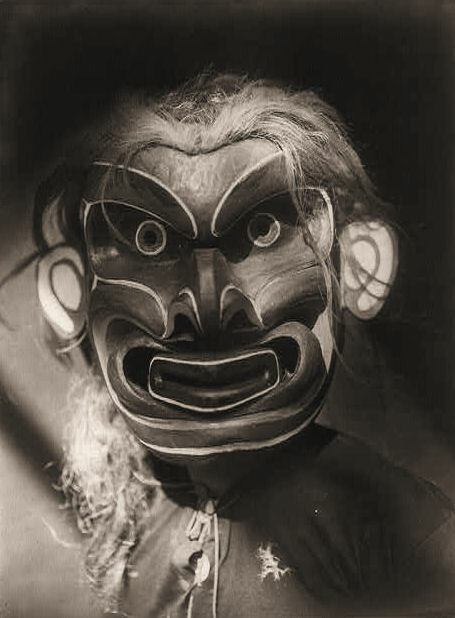 Left - A Kwakiutl person wearing mask of the mythical creature Pgwis (man of the sea). 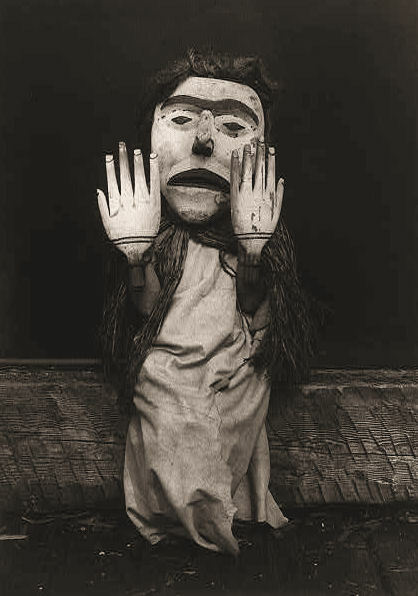 Mid - A Kwakiutl person wearing an oversized mask and hands representing the forest spirit Nuhlimkilaka ("bringer of confusion"). 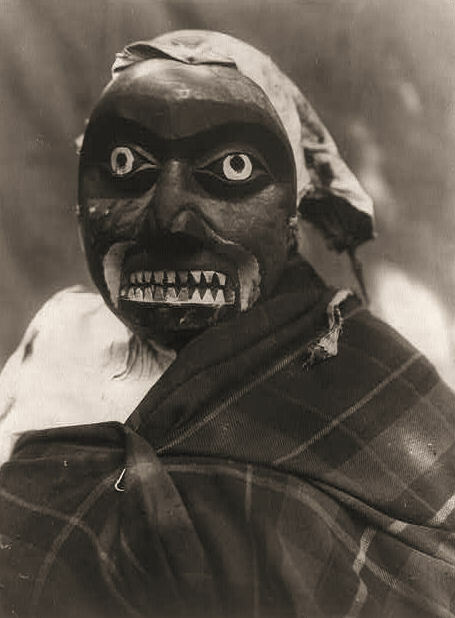 Right - Ceremonial mask worn by a Qagyuhl dancer portraying the hunter in Bella Bella mythology who killed the giant man-eating octopus. 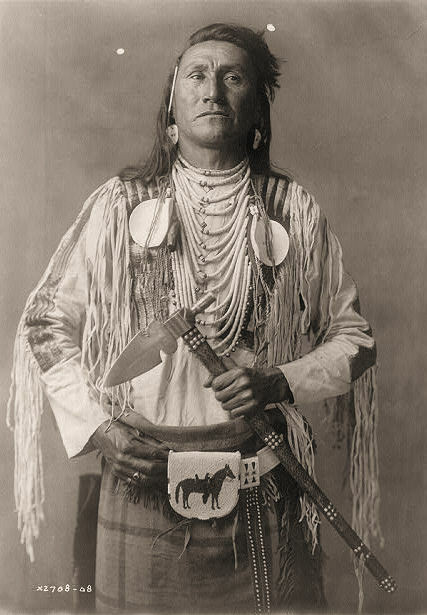 Left - 'Holds The Enemy' (Apsaroke) wearing several shell necklaces, a beaded pouch about his waist, and holding a tomahawk. 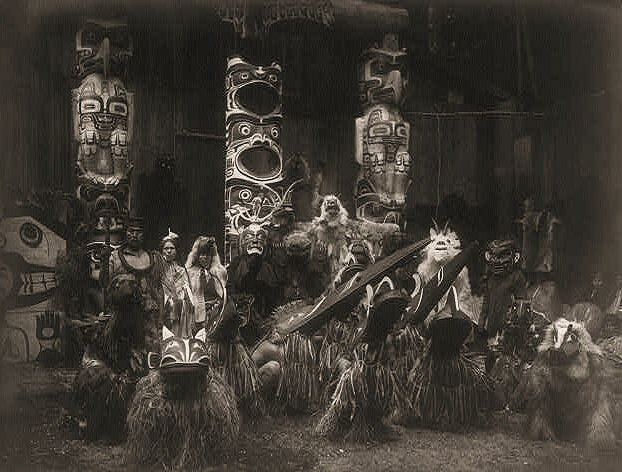 Mid - During the winter ceremony, Kwakiutl dancers, wearing masks and costumes, crouch in the foreground with others behind them. The Chief on the far left holds a speaker's staff. 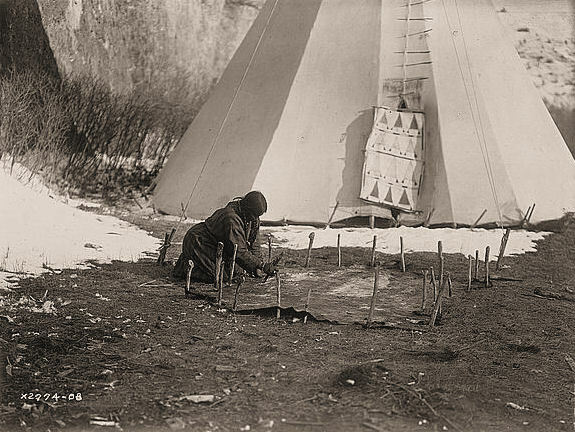 Three totem poles are seen in the background. 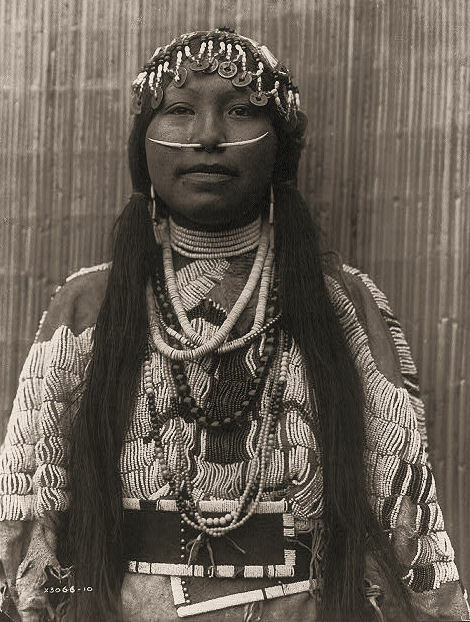 Right - A Tlakluit woman, wearing a heavily beaded buckskin dress, several necklaces, beads, shells, dentalium-shell nose ornament and a headdress of beads and hollow-centered Chinese coins. 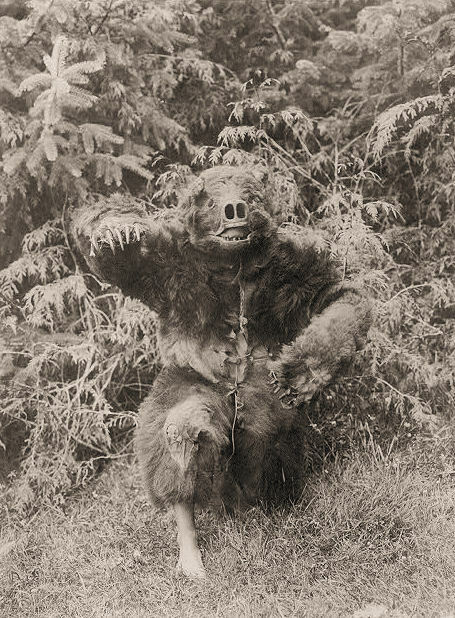 Left - A Qagyuhl man dressed in a full-body bear costume to guard the dance house. 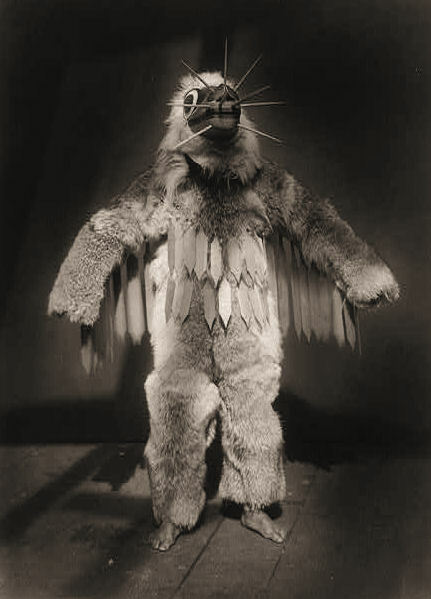 Mid - A Qagyuhl ceremonial dancer, wearing a mask and fur garments during the Winter Dance ceremony. 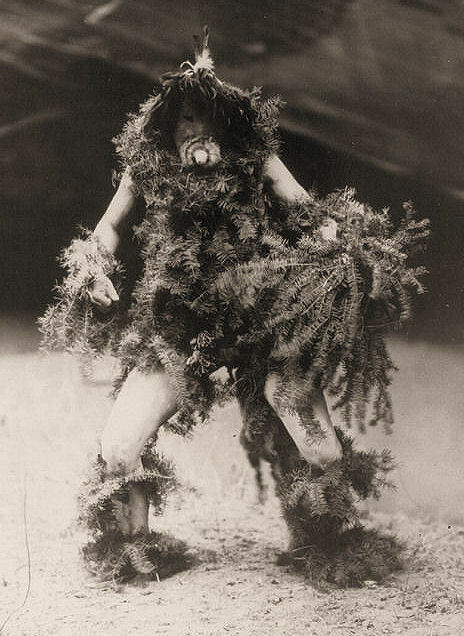 Right - A Navajo man in hemlock boughs and the mask of a clown associated with the mischievous rain god Tonenili ("Water Sprinkler"). 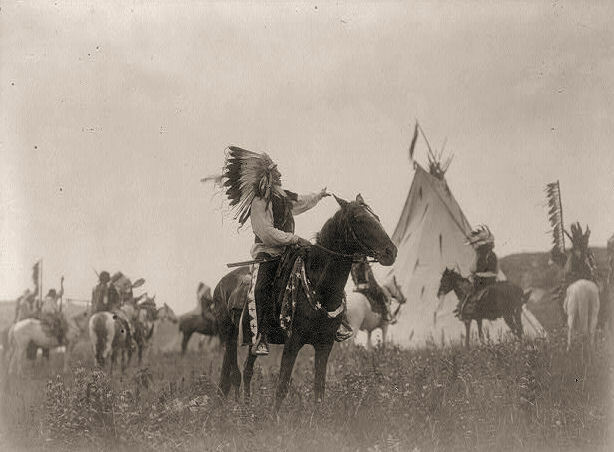 Left - A Dakota man, wearing a war bonnet, with his left hand outstretched toward others on horseback. 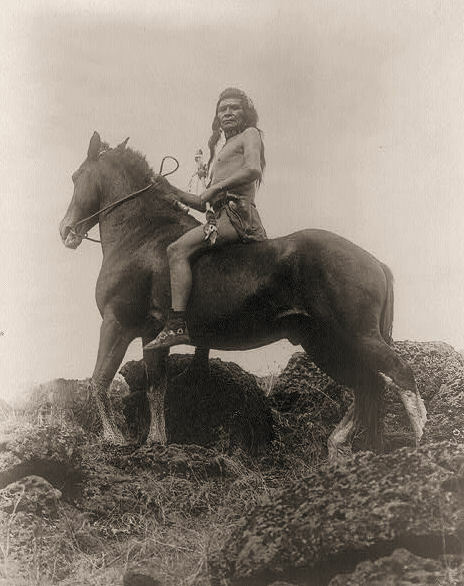 Mid - A Nez Percé scout, seated on his horse in a rocky area and holding a coup stick. 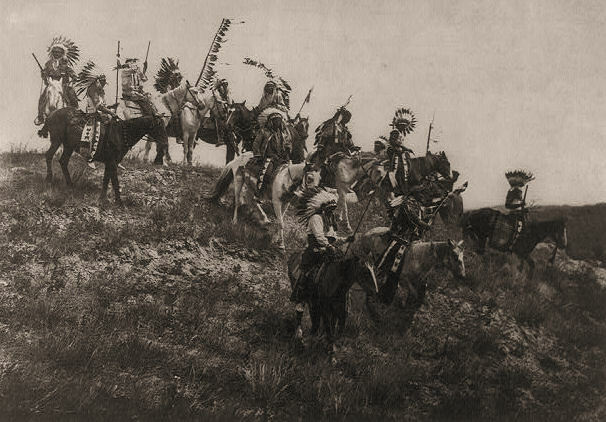 Right - Several Oglala men, many wearing war bonnets, on horseback riding down hill. 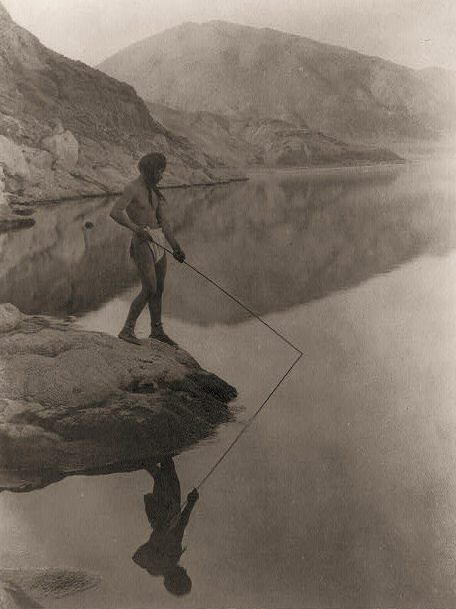 Left - A Paviotso man standing on a rock, fishing with a spear in Walker Lake, Nevada. 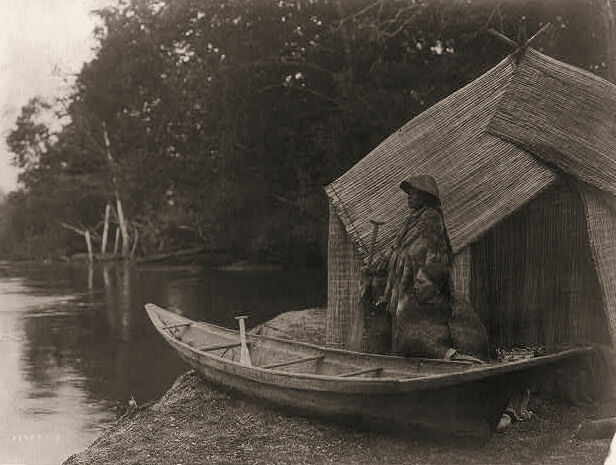 Mid - A Skokomish couple outside a house made of reed mats. 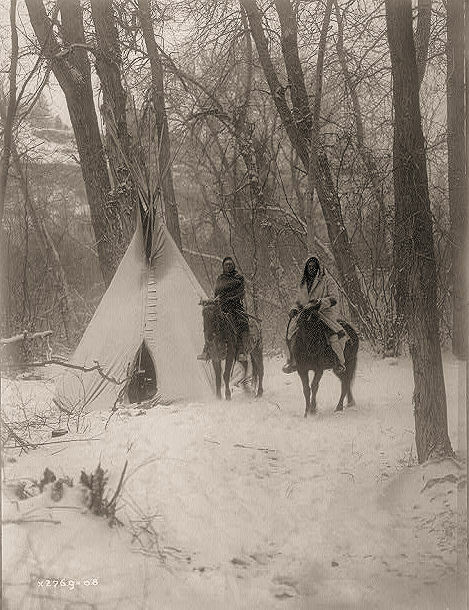 Right - Two Apsarokes on horseback at their snow-covered winter camp. 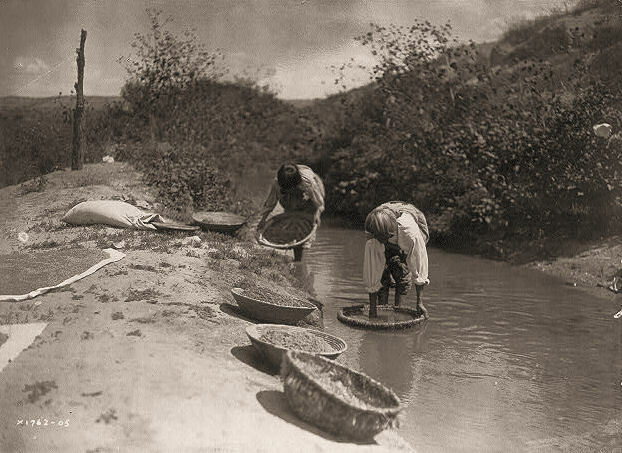 Left - Two San Juan women dipping baskets of wheat into an acequia, or irrigation ditch, to dissolve dirt and to float away debris from the wheat kernels. 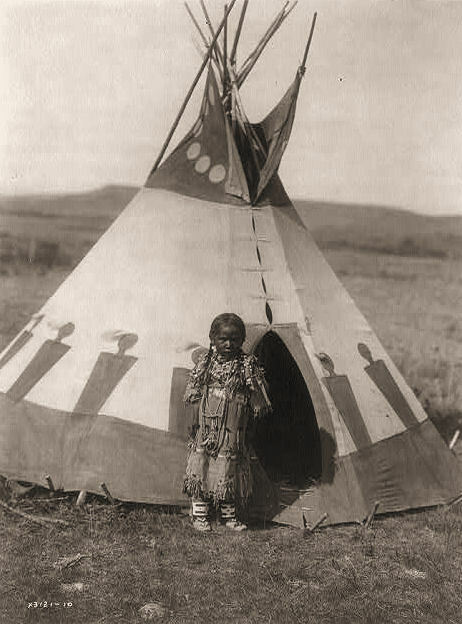 Mid - A Piegan girl standing outside a child-sized tipi. 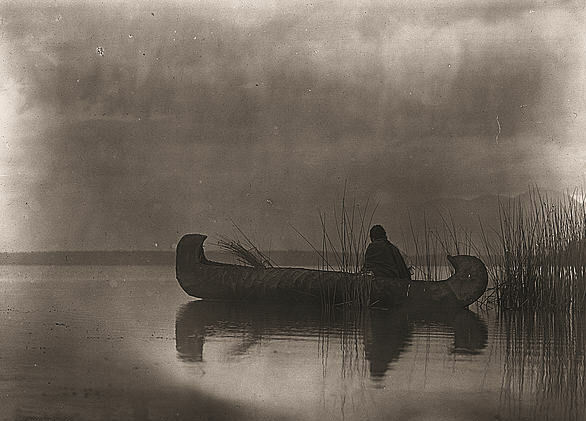 Right - A Kootenai man hunting ducks while seated in the bow of a canoe, nestled in sparse rushes. 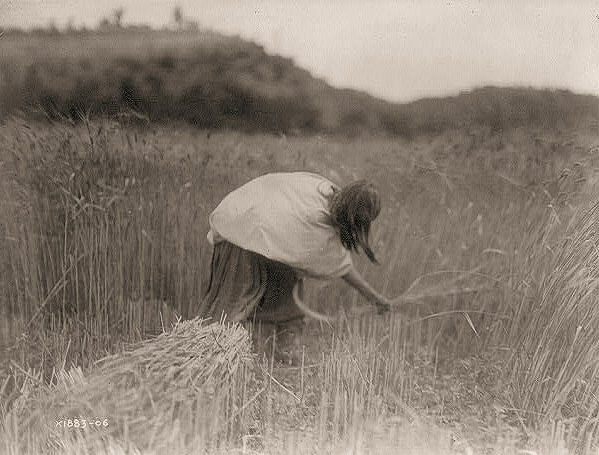 Left - An Apache woman harvesting wheat with a hand sickle. 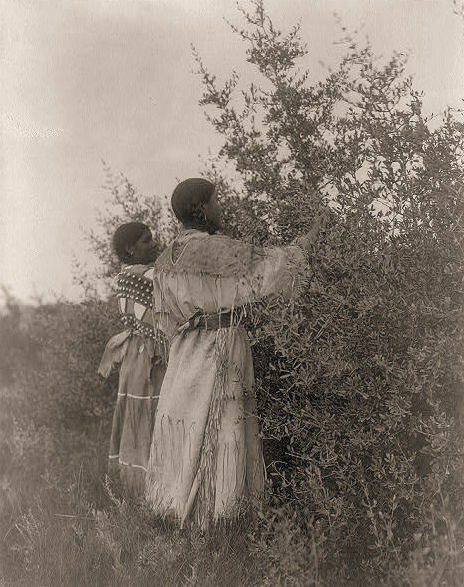 Mid - Mandan berry gatherers. 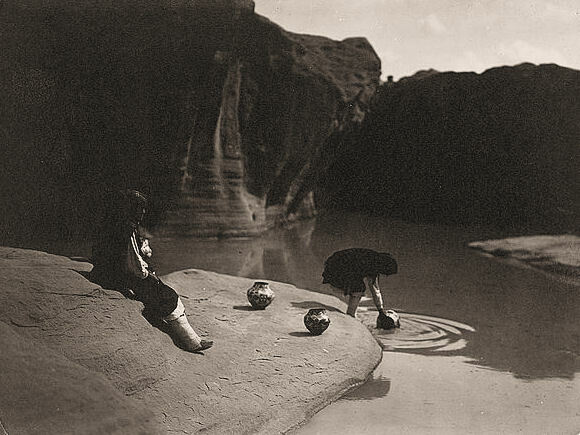 Right - An Acoma girl watches as another girl fills a pottery vessel with water from a pool. 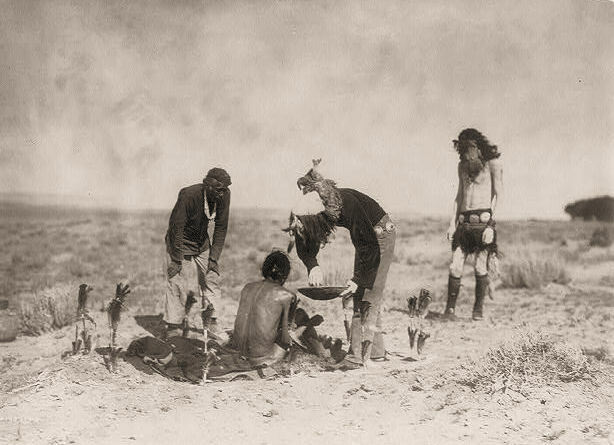 Left - A Navajo shaman gives medicine as two others look on. 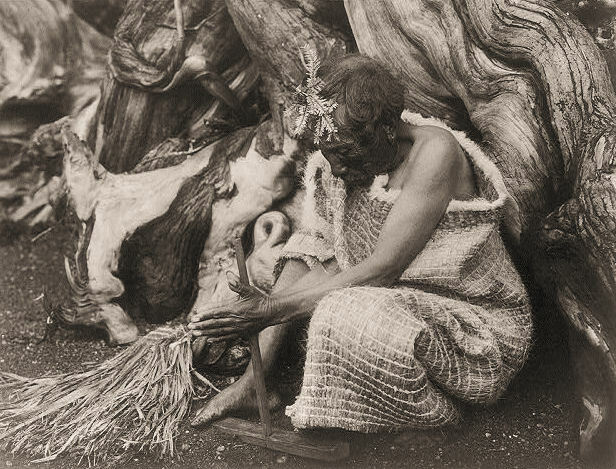 Mid - An Apsaroke woman scraping a hide that is secured to the ground by stakes. Right - A Koskimo man using a fire drill. 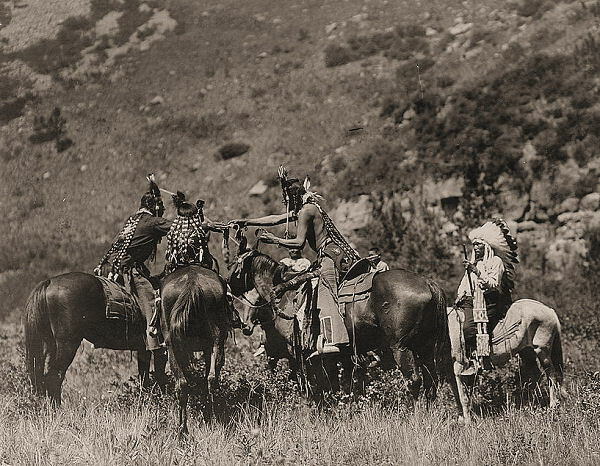 Left - Crow men on horseback apparently involved in a swap. 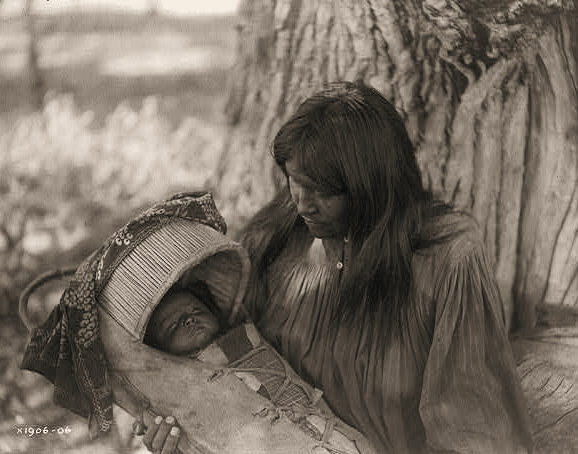 Mid - An Apache woman, holding an infant in a cradleboard on her lap. 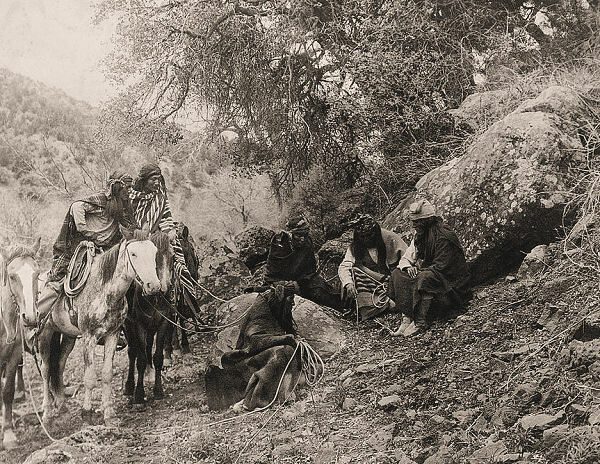 Right - A group of Apache men listening and looking on as one member of the party tells a story while marking the ground with a stick. 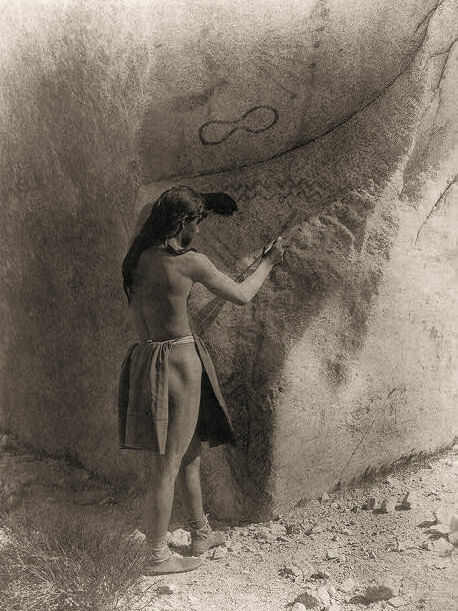 Left - A Paviotso man marking the side of a glacial boulder that already has petroglyphs on it. 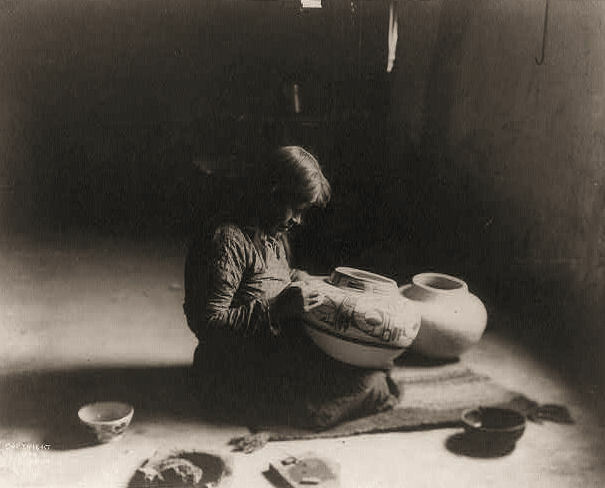 Mid - A Hopi woman seated on a mat while painting designs on pottery. 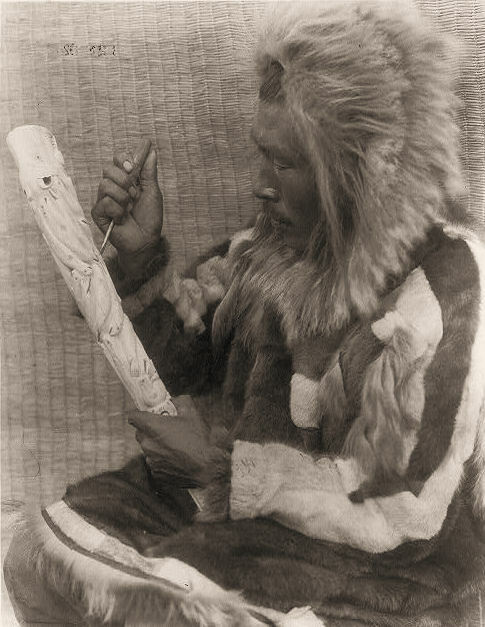 Right - A Nunivak ivory carver. 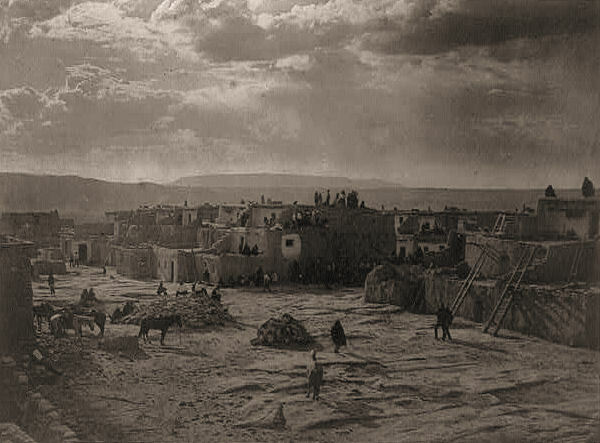 Left - Feast day at a Pueblo village. 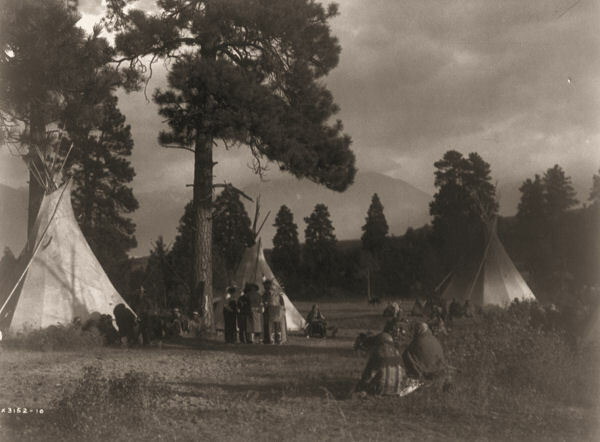 Mid - A Flathead camp on the Jocko River, with the Rocky Mountains in the background. 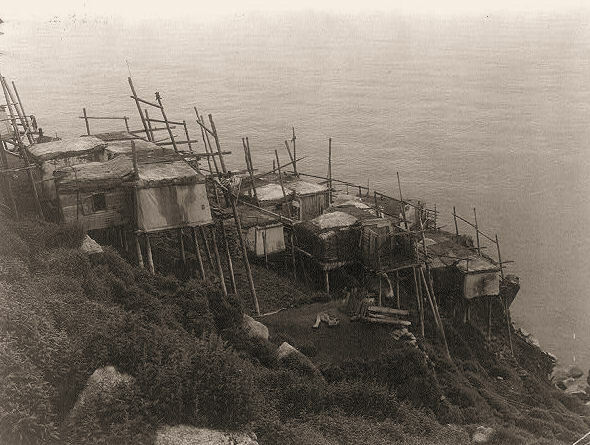 Right - King Island village, with houses on stilts on a terraced cliff above the water. 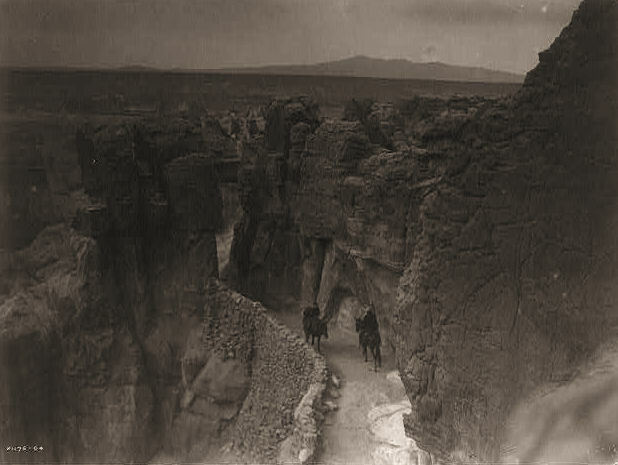 Left - Two riders on horseback meet each other on the old Acoma Trail, a passageway between rock formations in New Mexico. 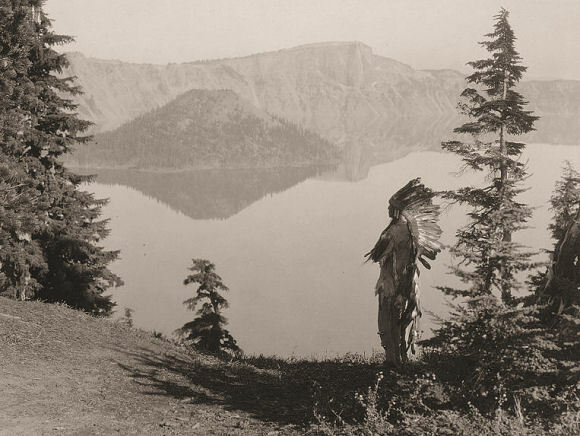 Mid - A Klamath chief in ceremonial headdress standing on a hill overlooking a lake. 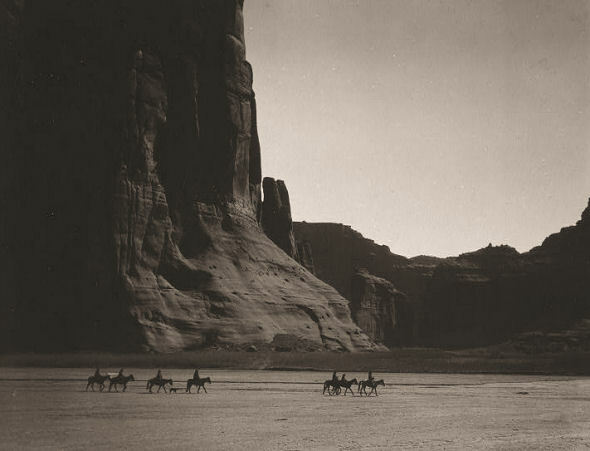 Right - Seven Navajo riders on horseback trek against a background of cliffs at Canon de Chelly, Arizona. 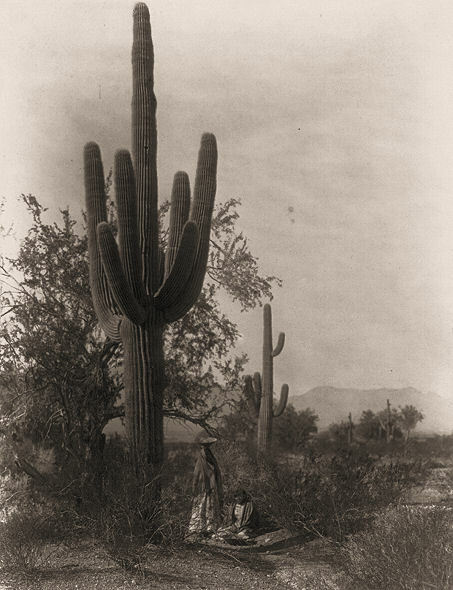 Left - Two Pima women harvesting "hasen", a sweet, pear-sized fruit from the giant Saguaro cactus, which may be eaten fresh or dried, could also be used to make syrup or wine. 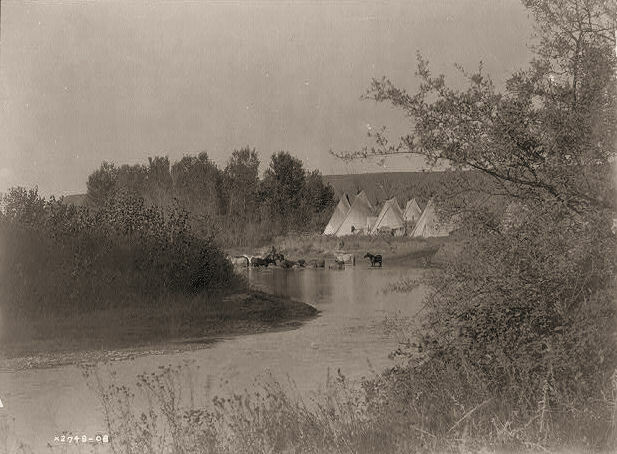 Mid - Horses wading in water next to a Crow tipi encampment on the Little Big Horn. 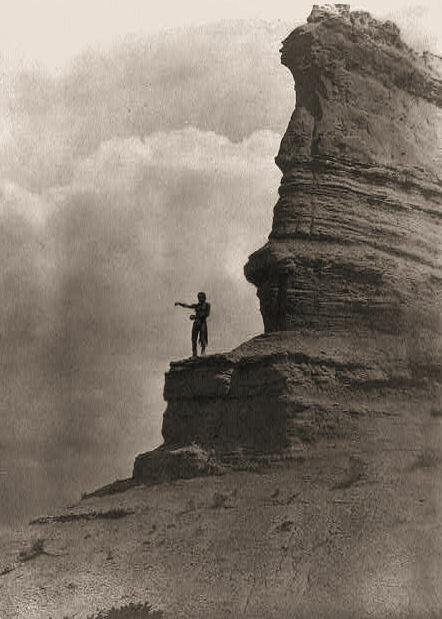 Right - A Tewa man, standing high on a cliff, arms stretched before him as he sprinkles cornmeal as an offering at the start of a day.